A journey into the centre of Leicester was Borough’s next challenge and they came through it with flying colours to keep their grip firmly on top spot. It was all change in the Borough starting line up with Aiden Print taking up an offer from Barwell and Josh Turton out for eight weeks with some ligament trouble picked up in last week’s fixture. Borough started at a fast pace and tried to unsettle the New Parks defence with early pressure. Brandon Oddy and Adam Shaw were causing problems on both flanks and it was a Shaw-Oddy combination that set up the first Borough chance, but the ball was completely missed by the on rushing Paye. From a Shaw corner in the 10th minute Brandon Berkeley should have given Borough the lead when in acres of space, but again the ball was completley missed to the relief of the New Parks defence. Borough were becoming dominant both in possession and attacking but creating very little in the final third. That all changed in the 25th minute as Oddy beat the offside trap and the keeper to but Borough in to the lead. Glasscoe, Paye, Shaw and Berkeley all had chances to increase the lead before half time but to no avail. Within a minute of the restart Allexton should have equalised, the Borough defence opening up for the number 9 who was in acres of space to fire way over the bar. A let off for Borough and the wake up call that they needed. First Shaw hit a rasping drive inches from the post. Glasscoe, who was making excellent runs from midfield, shot wide and Harley Matarutse skimming the cross bar from 18 yards. It was in fact a run from Matarutse who was then upended in the box for the referee to give a simple penalty. Jamie Paye slotted it into the corner for 0-2. What followed was a ruthless three goals in a 10 minute spell with Allexton not knowing what had hit them. Sheldon Berkley notched two, both from runs into the box and Matarutse got his deserved goal after working tirelessly all game. The goal of the game came in the final minute. The Allexton substitute beautifully lobbed the Borough keeper to get Allexton a deserved consolation goal. Borough Man of the Match was the returning Sam Beasley, who kept a lively Allexton wide man quite whilst joining in when Borough went forward. 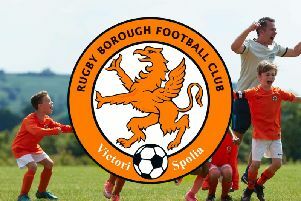 Borough’s next game is at home on Saturday when league rivals Thurnby Rangers visit Kilsby Lane. In four meetings Borough have never beaten the North Leicestershire outfit, last season drawing in the cup and going out on penalties. The home league fixture was a draw at 2-2 with Borough equalising in the last minute. The reverse away losing 1-0. In the fixture earlier on in the season Borough lost 3-1 and that was when the change in the management structure came. Manager Ady Fuller has no illusions about the task facing his team this Saturday. “Thurnby are a good solid side with three or four excellent individuals who can change games with that extra piece of quality,” he said. “We have a poor record against them but looking at their results recently they are on a bit of a dip. We need to be at our best and go for the win to extend our lead over them. They will be there or there abouts at the end but we can inflict some damage with a good result on Saturday.” Fuller expects to be at full strength for the game and final decisions will be made on the line up after training on Thursday. Borough are expecting a decent crowd for the game which kicks off at 3pm. Admission is £3 adults and £1 concessions.